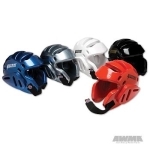 - 3/4" thick vinyl covered foam offers protection for top, back, and sides of head. - Protection also covers forehead. - Cutouts around the back of neck allows for more mobility. - Specially designed cutouts allow for greater ventilation. - Ear protection allows for normal hearing. - Cutouts around eyes allow for greater periphery vision. - Fastens with elastic strap under chin that secures with hook and loop closure. 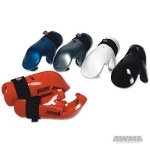 - Matching sparring gloves and boots also available. 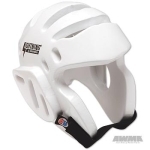 - Designed for use with Lightning Face Shield and Lightning Face Cage. - 1/2" thick vinyl covered foam offers protection for sparring over entire fist and wrist. - Protection extends to cover part of forearm as well. - Cutouts around forearm provide for better hand mobility. - Double layered padding at knuckles for increased protection. - Palm has reinforced vinyl strap to keep gloves secure. - Open palm style allows for grappling. - Finger slots keep glove in place as fist is made. - Fastens with elastic strap that secures with hook and loop closure. 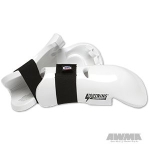 - Matching sparring head gear and boots also available. 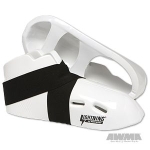 - 1/2" thick vinyl covered foam offers protection for sparring over the entire foot and ankle. - Cutouts around achilles and instep provide for better dexterity and mobility. 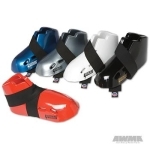 - Bottom has two reinforced vinyl straps to keep boots secure. - Open areas at heel, ball of foot, and toes allow for better gripping on floors. - Available in men's sizes. women order 1 size smaller. - Matching sparring head gear and gloves also available.